In 2007 my mug graced my brand new Italian Passport. The process to become a Cittadina Italiana took me about three years and numerous trips to the Philadelphia Consulate. It took my sister less than one year and two trips to the Newark Consulate. It took my niece (her picture is above) about 6 months. It will take my cousin about three years plus. WHAT???? Let us start at the beginning. The questions most people ask me are these: Why would you do it? What is the benefit of having dual citizenship? Is the process difficult? How much did it cost you? Why wouldn’t I do it is more like it. In the early 1990’s I started actively researching the Guerrera Family Tree. Piece by piece, I was collecting data, adding branches and getting more and more involved with the lives of people I had never met. To get a better handle on the research, I knew that I had to go to Pontelandolfo and visit the archives of the commune. Zia Caterina, Jack and I made that journey in 1995 – another blog will tell you that whole story. We not only added numerous branches to the tree but discovered my father and Zia Caterina’s first cousins! When Zia Caterina and I had gone to Italy in the 70’s their uncles were still living – we missed an incredible opportunity then. After meeting my extended Italian family, I became even more obsessed with all things Italian. Particularly, all things related to this small village in Campania, Pontelandolfo. While we were there I bought a few copies of my grandmother’s and grandfather’s birth certificates and certificate of marriage. That was an incredibly smart thing to do since folks have told me it is difficult to retrieve those documents via mailed requests – unless you use a service like http://myitalianfamily.com. A quick search on line revealed that I was indeed eligible for citizenship – an act which would bring me even closer to my roots. There was no “aha” moment or benefits lightbulb that exploded in my brain – just the deep seated need to be closer to my “i parenti,” the DNA that makes me who I am. How American of us to want to know what the hell we get out of the deal. Like feeling closer to ones heritage isn’t enough! Well, let me think what do I get out of it? If Jack and I really do retire to Italy we are already part of the Italian community. During the Bush Jr. years, My sister and I did talk about moving quickly forward so that if the draft was reinstated and we didn’t particularly agree with the why behind the war we could get her kids out. Now, that might have been our 1960’s sensibilities kicking in, because Italy had mandatory service until January 1, 2005. The other benefit is being able to work anywhere in the European Union – a benefit that my niece is actively using. Further, I can stay in Italy or any of the Schengen Treaty countries for as long as I like – no ninety days for me! ( Of course we are only staying 90 days this trip because Jack hasn’t applied for spousal citizenship yet.) The USA State Department explains all this. http://travel.state.gov/travel/cis_pa_tw/cis/cis_4361.html OK, I am bored with the what is the benefit idea – the benefit is IT MAKES ME HAPPY. Ah, this is tricky! In the over ten years since my family has gone through this process it has changed based on who we spoke to in which consulate and new regulations. Here is the basic tenet – if one of your parents was an Italian citizen at the time of your birth – no matter where you are born – than you by blood are an Italian citizen. Yikes, my dad was born in Manville, NJ – does that disqualify me? No! My grandparents had not become American citizens until after my dad’s birth. That automatically made him an Italian citizen living abroad. Did my father know that? No! When I explored the process I explained it to him and he couldn’t believe it. He had served as a Navy pilot during WWII, had been Mayor of our home town – how could he also be an Italian citizen? Guess what – lots of you probably are eligible – here is what is currently on The Italian Embassy Website. CITIZENSHIP BY DESCENT / DESCENT (” jure sanguinis “) And ‘the son of an Italian citizen parents (father or mother) Italian citizens. Citizenship is transmitted from parents to children regardless of generation, with the condition that none of their ancestors ever renounced the nationality. Go to the web site to read all of the rules and regulations. 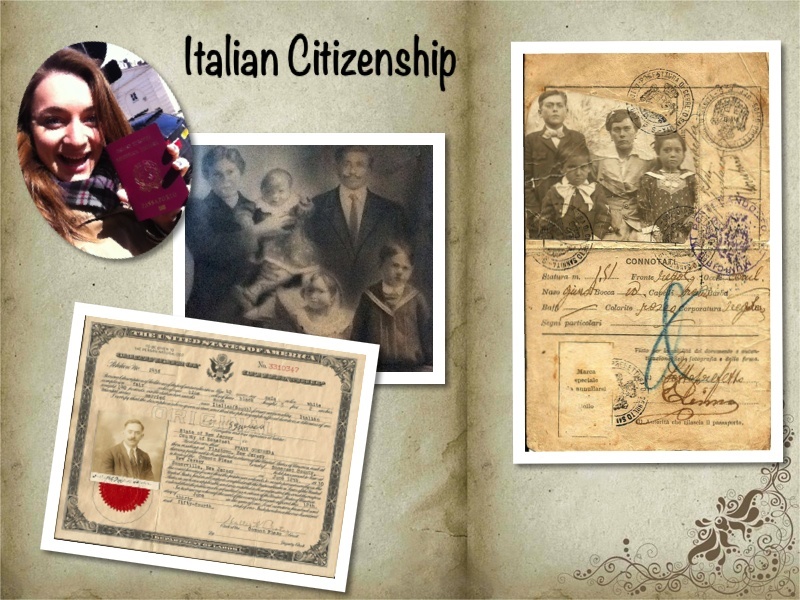 The first step is to discover when the elder of your Italian American family became a citizen. We were lucky, my Zia Caterina saved everything. Including her dad’s certificate of citizenship. We still have the original! Since my dad didn’t know he was an Italian citizen, he didn’t renounce it. When he found out, he was thrilled and admitted he never would have renounced it. OK, I had the blood line covered. Now what – this is the story of what I went through. Next will be my sister’s story, then my niece and finally my cousin. How do I obtain a record with an Apostille Seal? You must purchase a copy of your vital record from the Office of Vital Statistics and Registry and indicate on your application that it is needed for Apostille Seal. You will receive a certified copy, which contains the original signature of the State Registrar or Assistant State Registrar. You must forward this certificate to the Department of Treasury requesting an Apostille Seal. Since my parents were married in New York City, it took a full day to gather the documents from NYC Boro Hall and then walk a few blocks to the State of New York Office to request the apostille. During each step of the process, I purchased additional copies of every document so that my sister would have a set. When I had a completed set, I made an appointment at the Philadelphia Consulate and carried the box in. I did make a copy of my entire packet, just so that I knew what I submitted. About one and a half years later I got a letter from Pontelandolfo saying that I was a citizen. Wheeeeeeeeooooooooooo. Susan had copies of all of the documents. When she got around to doing this, residents of Somerset County New Jersey were told to use the Consulate in Newark. We read the website and made an appointment for her – it was about four months out. We also read the new regulations – she needed a translation of every document – including the apostiles. You were only allowed to use an Italian translater from the consulate’s approved list. That cost her about $50 a document. This was all done via e-mail. We scanned the documents and sent them off. Scanned translations came back. This was great we thought – because now my cousin Maryellen can use the same translations. Susan took her two children to the appointment. We figured we would process everyone at the same time. WRONG. Susan had to be certified first. She was missing something – I can’t remember what – but I do remember pleading and begging with the consulate employee because whatever it was I knew was on file from me in Pontelandolfo. Susan made a second appointment and returned with whatever had been left on the dining room table. During the second visit, she is given a document that she is told her daughter can use to prove lineage and easily apply for citizenship. We go for dinner and a drink or three. Just a few months later Susan gets her letter of recognition. Alex lives and goes to university in London. I suggested she use the London Consulate. She took her handy document from Newark and back up documents and headed to that office. They told her she needed to supply the same complete package that her mother had submitted and that the little certificate from Newark was nothing. UGGGGG. All of this is now done electronically, Alex asked if they couldn’t just get the same documents sent back to them? No. Another appointment please. Oh yeah, now we have to make the packet and get it to London! She brings the packet and is nervous about completion. She would like to stay and work in Europe and the EU Passport would be very helpful. Months go by and she hears nothing. She visits and e-mails the London Consulate and they say all things were e-mailed to Pontelandolfo. We asked our cousin to visit the Pontelandolfo office of Vital Statistics and check on Alex’s status. Instantly, her paperwork was done and her certification sent off. Takes all of the same documents – but adds her dad’s information – translated and in a cute folder to her appointment at the Newark Consulate. There, she doesn’t get past the triage dude. You see, my grandfather’s birth certificate from Italy says Francesco Guerrera but his citizenship papers say Frank Guerrera – how do we know it is the same person? This name change – a common occurrence – happened with her father’s documents and our grandmothers. They told her nothing could be processed until she got the documents certified as belonging to the same person. I was with her and argued up a storm, explaining that two of us had already used the exact same documents and gotten citizenship. 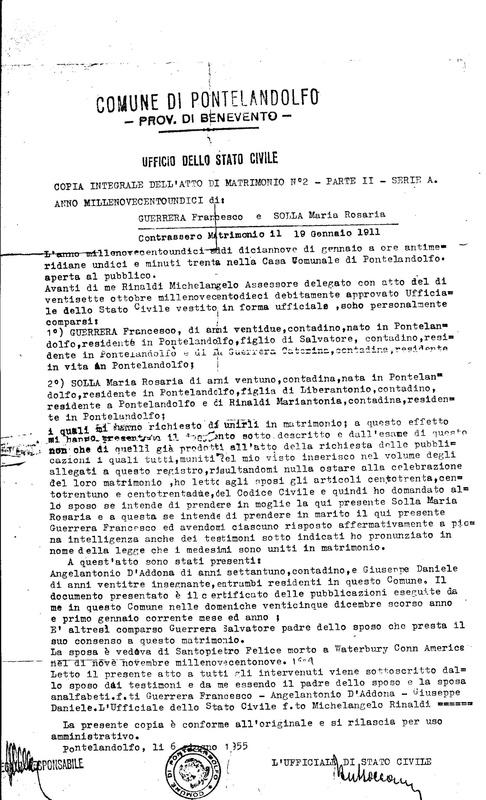 Further, all of the documents were already on file in Pontelandolfo. He shrugged. We left and Maryellen hasn’t moved the process forward. So lessons learned. Double check everything. Read all new regulations. If you can, have a local relative in Italy lobby for you! What did it cost me? Do we count the trip to Italy to buy the birth and marriage certificates? I’d say if you include travel and all the mistakes I made it cost me about $1,000. It cost my sister about the same because it was $50 a document for translation plus the cost of the original documents and apostile. Next postStreets Closed for Calcio! Fascinating stuff. This makes me want to trace my Irish relatives. I guess I could start with the papers from my grandmother and aunt winnie that are someplace in my attic. Meanwhile I’m off to make more pasta and fava beans for dinner. I figure that is the perfect summer solstice meal. Midge – I will have to ask you to walk me through this when you get back. When my family traveled to Italy in 2004, they met some of my father’s distant relatives. I have urged him to look into it further but had no idea how! This is very interesting. Send our love to Jack. By the way, Braedyn and Bryce loved the video blog!